First Snow Day in Mystic. Panic and Boats ensue. 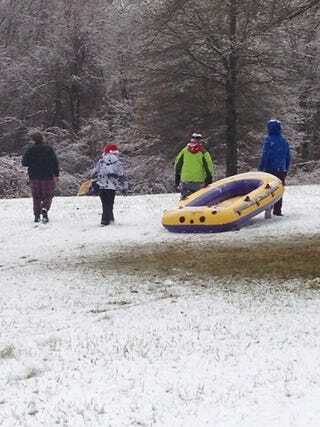 This is what happens on the first snow day in coastal Mystic, CT. School was cancelled and my boy dragged his boat out of the basement. This is his posse headed down Hell's Hill. My boy is on the right. In jammies. They all loaded into the boat; Mystic Boy is the only one who wasn't thrown out of the ride. I'm a proud Mamma.